2017 was not a great year for writing. In fact, my total word count was the lowest since records began; or to be precise, since 2004 when I started writing again after a 12 year break. I wrote 3 flash fiction story, and one story that just crept up into novelette range. I also sold one long novelette and saw 3 stories published this year, in Spanish, Polish and my multi-author collaboration Something On Your Mind? in English. Maybe I'll make a comeback next year. My collaborative story Quivira, co-written with Jonathan C. Gillespie, which has been accepted by The Society of Misfit Stories now appears on their updated schedule and is due to appear in August 2018. I'm rather looking forward to it. Unlike half of the world’s population, I haven’t read Andy Weir’s debut novel The Martian, but in common with the other half of the population I did watch the film and rather enjoyed it. 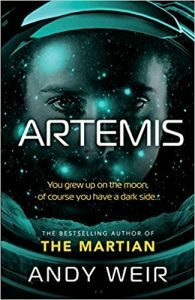 Andy Weir returns to the world of populist hard SF with Artemis which takes us this time to the Moon, location of the eponymous lunar city. 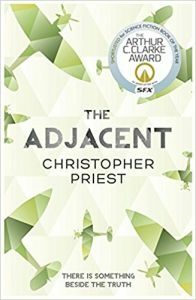 I hardly know where to begin in describing Christopher Priest’s The Adjacent. It’s a multi-stranded novel that alternates the tale of Tibor Tarent, a free-lance photographer in near-future Britain, with a selection of tales from earlier time periods and other places that feel like they are almost related somehow, without making the connection obvious.